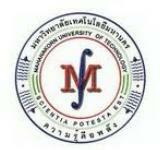 Mahanakorn University of Technology is a university in Thailand. The university was established on February 27, 1990 at Nong Chok District, Bangkok. as Mahanakorn College by Prof. Dr. Sitthichai Pookaiyaudom, former Dean of King Mongkut’s Institute of Technology Ladkrabang. The objective was to train engineering students in response to the severe shortage of engineers as Thailand made rapid progress in technological development. Because of a serious commitment and success in both education and research, MUT was promoted in a short time to advance to full university status under the new name Mahanakorn University of Technology .It is the first and still the only university in the country that operates its own low-orbit microsatellite (TMSAT). Faculties: The new university grew rapidly and its teaching program won recognition countrywide as a leading standard in technological education.At present the curriculum includes four faculties, Engineering, Information Science and Technology, Veterinary Medicine and Business Administration. Doctoral and Master Degree programs are offered in addition to Bachelor Degree courses. The main campus of the university is located in Nong chok District, Bangkok. Another campus is located at Vanit2 Building on New Petchaburi Road, Central Bangkok. The aim of producing graduates of the highest ability depends on the quality and experience of academic staff. MUT has built up its permanent staffs larger than any other private universities in Thailand. A massive and continuing investment is located in the field of teaching competence and research laboratories which match facilities found anywhere in the world in most area. Students become familiar with the most modern instrumentation in a learning environment reflecting contemporary industrial practice. Oversea-Cooperation: Cooperation with leading oversea universities has played an important role in the development of MUT at the beginning and still now. Partnership has been established with the University of New South Wales and University of Sydney in Australia, Imperial College, University of Surrey and University of Coventry in United Kingdom, Veterinary University of Hannover in Germany and Korean Advanced Institute of Science and Technology (KAIST) in South Korea. MUT and Imperial College has jointly established an electronic circuit design laboratory in Imperial College London. This is a unique venture providing MUT staffs with research and electronic design facilities of world standard. The centre was officially opened by Her Royal Highness Princess Royal, daughter of Her Majesty Queen Elizabeth II. It is a valuable research centre for Thai doctoral students and a gateway for Thai industry to access the latest advances in Microelectronics. Notable Activities: Another notable activity of MUT is the design and construction of a microsatellite. The satellite was built in the University of Surrey by a team of MUT engineers. This satellite was launched in March 1998. The satellite construction has enabled Thai engineers to gain expertise in satellite technology. The satellite was named “Thai Paht” by His Majesty King Bhumibol. It is controlled from the ground station on the Nong Chok campus. The station has opened educational centre for communication engineering students and a research centre in satellite engineering. Images downloaded from the satellites are used in the study of regional and environmental features. A program of further satellite construction is underway in cooperation with Chinese and Korean satellite research institutes. Mahanakorn has established itself as notable research centre both nationally and worldwide. MUT staffs have published the largest number of articles among Thai academics in international engineering journals. Several projects have also been recognized for their contribution to society such as mine detector, unmanned arial vehicle and water filer. International and National Recognitions: In the twenty years of MUT, several generations of high quality graduates have entered Thai industry. A survey has shown that they perform well especially in the period of economic crisis. This critical tasting period has confirmed the value of education provided by MUT and the lasting contribution made to the future of Thailand. Consequently, MUT is recognized not only domestically but also internationally as a leading university in science and technology. MUT was ranked 36th by Asia Week Magazine in category of Asian Best Science and Technology Institution within ten years after it was founded MUT’s latest achievement is to accomplish a score of 4.86 out of 5 which is the highest score in category of Research University in the latest assessment by the office for National Education Standards and Quality Assessment (ONESQA), a public organization set up to assess the performance of all educational institutions from schools to universities, in two categories: research and learning qualities and the quality of graduates.